Dr Safdar Sarki - law abiding American citizen, tireless human rights campaigner, devoted husband and father & a victim of 26 months of unlawful detention by Pakistan. 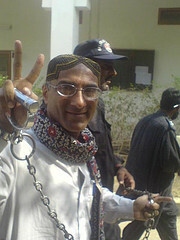 BREAKING NEWS - 1 May 2008 : Dr Safdar Sarki has been released. © Dr Safdar Sarki. All Rights Reserved.